"Ilunga Patrice, Misomba Victor and Friends"
Intersections of cultures – rural and urban, national and foreign, ancient and modern – are found in many parts of the world but are especially fascinating in Africa. A continent of great cultural diversity to begin with, where some 2,000 languages are still spoken today, Africa has also received visitors from other continents over the ages, though seldom by invitation. Invaders, slave-raiders, plunderers, missionaries and colonialists have meted out far more harm than benefit to Africans, and yet the history of African interaction with the rest of the world has not been entirely dismal. Enslaved Africans brought their music to the Americas, where it took root and flourished, developing into the hybrid styles that in modern times became popular not only throughout this hemisphere but around the world as well – most profoundly at their source, where contemporary Africans recognized their ancestral sounds and rhythms and were inspired to reclaim and remake them anew. Such cultural intersections are explored in Listen All Around, the latest of Dust-to-Digital’s estimable presentations of historical recordings. Two CDs encased in a hardcover book, this album resurrects field recordings made in Africa by Hugh Tracey, an Englishman who emigrated in the 1920s to the British colony known at that time as Southern Rhodesia. 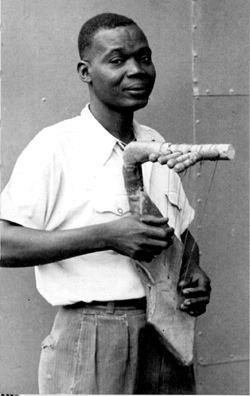 Tracey was a farmer with no academic credentials in anthropology or musicology, but he was enthralled by the songs his Shona field hands sang and by the instruments they played, and when tape recorders became practical in the late 1940s, he started recording their music. Soon he was hauling his recorder around Rhodesia and then leading expeditions as far as the Belgian Congo and Uganda. 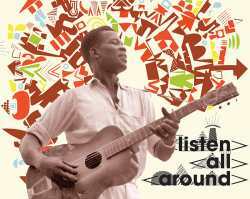 The more music he heard, the more he wanted to hear, and over a span of thirty years he made thousands of recordings in twelve African countries. Archived at the International Library of African Music in South Africa, some of Tracey’s recordings were issued on phonograph records in his lifetime (he died in Johannesburg in 1977), and since then ILAM has issued a marvelous Hugh Tracey series of 24 CDs through Sharp Wood Productions. That collection, curated by Michael Baird, is organized mainly by country, region or ethnic group, and while it includes selections of early modern styles, traditional music predominates on the whole. The much smaller Dust-to-Digital set focuses on new styles emerging in the 1950s, specifically in East and Central Africa. Only three of its 47 tracks can be found among the hundreds in the Sharp Wood set, and the newly-available material is reason enough to welcome this release, but it’s all the more compelling for how it reveals the various ways that new forms of music developed in that part of the world in that particular period. The 1950s were a consequential decade for Africa. European dominions still ruled most of the continent, but in the aftermath of the Second World War and the chill of the Cold War they were losing their grip on their colonies, where incendiary ideas of civil rights and self-government were spreading. To moderate their regimes and subdue insurrection, colonial authorities lifted restrictions on assembly and travel, raised wages, and improved conditions in cities and mining towns, notably by extending electric service to “native quarters”. Such measures did little to suppress independence movements but a great deal to bring about the cultural intersections that begot new music. People moved from hamlets and villages to towns and cities where they mixed with people of different ethnicities, speaking different languages and practicing different customs, and they heard music that was unfamiliar but not unappealing and perhaps not all that incompatible with their own. Musicians attracted broader audiences when they played something old and something new, something borrowed, something original; when they sang in a lingua franca instead of a tribal tongue; when everybody could join the dance. And audiences – working men and women earning more now – could afford to spend a little of their money and free time in bars and dancehalls where musicians performed, or save up to buy imported goods such as radios and phonographs, which enabled them to hear music from far, far away – to listen all around. The recordings in Listen All Around have been selected, with ILAM’s participation, by Alex Perullo, who is an anthropologist and musicologist and has written the 84-page book that holds the CDs. He begins the text with an overview of the cultural, political and sociological landscapes of Central and East Africa in the ‘50s and proceeds with remarks on the growing influences of music from South, West and North Africa, from Arabia and India, from Western Europe and from the Americas (especially the Caribbean), thanks to records and radio broadcasts. He traces Tracey’s recording trips, describing his methods and equipment and the daunting technical and logistical challenges he and his crew met, and then gets to the results, devoting most of the book to commentary on each selected track. In this Perullo is greatly aided by Tracey, who took detailed notes, inscribed musicians’ names, got the stories of those who especially impressed him, and sometimes wrote down his thoughts about the music he’d just heard. The professor adds his own thoughts, which are informed by academic studies and his own travels and research but expressed clearly for unscholarly readers like me. Consulting African linguists, he gives song titles in their original languages and English translations, quotes translated lyrics, and offers cogent explications of their context. Interspersed in the text are photos of locations, musicians and audiences, most taken by Tracey or his wife or son. And yet, as everyone involved in this smart, attractive production undoubtedly agrees, Listen All Around is first and foremost an aural album. Hearing it is a pleasure. One catchy song or inviting dance after another, it’s an album one can enjoy from start to finish without thinking about history, culture or context; this is good music in and of itself and, with new digital transfers from the original tapes, the sound is fresh and clear. But of course there is more to any music than what we hear from outside its maker’s world. Knowing something about that place and time, even just a little, helps us to imagine the music’s creation, which is a good way to listen to records. Hugh Tracey’s picture of Pierre Bakia shows a man in a small Congolese town playing a kundi, a local four-string harp, which Bakia, in his song, identifies more tellingly as “Gitari na Congo.” In Stanleyville, the largest port-city on the upper Congo River, a group of soldiers sings a song in Lingala, the trade language adopted by the colonial force publique, while Joseph Eluka finger-picks an imported six-string guitar employing a traditional likembe thumb-piano pattern, and fellows with sticks and beer bottles tap out a maringa beat (which could be distantly related to Dominican merengue). Salum Seliman, a veteran of a military marching band in Zanzibar, keeps its old brass instruments and teaches young men to play them with brio and swing. In metropolitan Nairobi the all-male Coast Social Orchestra plays a traditional women's dance with the appropriate ngoma drum but also a clarinet, a saxophone, a trumpet and an accordion that wouldn't sound out of place in a Parisian salle de danse in 1952. The Merry Black Birds look and sound like they could be in a ballroom in New Orleans or Havana thirty years earlier. The Dar Es Salaam Jazz Band brings out a violin and “singing horns” (kazoos) to perform a popular Kiswahili love song. Most of these people make music mainly to entertain themselves and their neighbors, friends and co-workers, as people always have, but lately a few busk for tips or get hired to play at dancehalls or attract customers to bars. 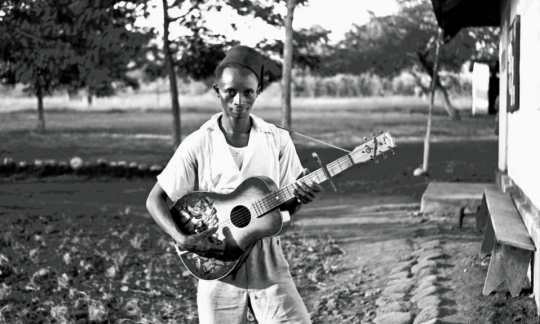 Charles Ombiza, leading a small group in Stanleyville, sings “Ushuru wa Guitare” with both pride and amusement at being paid to play his guitar. 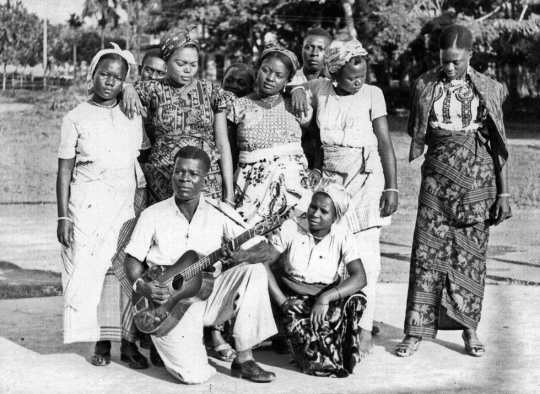 Several of these artists have traveled to neighboring countries for better gigs, and one – Jean Bosco Mwenda, a singer and guitarist Tracey records in the Congolese mining town Jadotville in 1952 – will go on to perform in North America and Europe. This album documents a period in which music is becoming more than a custom, more than a skill: a profession. However, probably the most famous recording in Listen All Around is sung and strummed by a little girl named Chemutoi Ketienya and a few of her friends in a village in the highlands of western Kenya in 1950, never to be heard from again. “Chemirocha” derives its fame (at least among ethnomusicologists and nerds like me) from Tracey’s conjecture that its title refers to Jimmie Rodgers, the American “singing brakeman” popular in the 1920s and early ‘30s, whose records – along with many others from the United States – were available in East Africa. Later researchers have noted that in various songs and tales of Miss Ketienya’s Nilotic tribe Chemirocha is a high-prancing mythical creature, half-man, half-antelope. 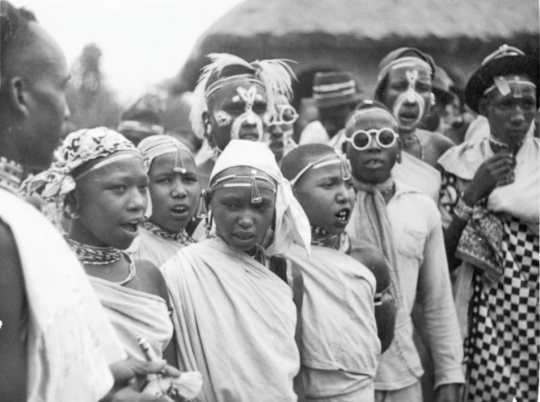 Perullo relates a recent interview with a chief of the Kipsigis who explains the local belief that white people drink black people’s blood: it began when British medical officers collected blood donations for wounded troops during the Second World War. How any of this interesting information confirms that “Chemirocha” is about or inspired by Jimmie Rodgers is unclear to me, but I still find it to be an utterly enchanting song. In any case, it is true that American country and western music has long been popular in East Africa. Its influence is unmistakable in “Mpenzi Wangu Wanitupa” (My Sweetheart Left Me) by the Sunderland String Band of Dar es Salaam, not only in the thrumming guitar, banjo and mandolin but even in the melody, which Perullo likens to “I Wonder Where You Are Tonight”. © 2018 RootsWorld. No reproduction of any part of this page or its associated files is permitted without express written permission. RootsWorld depends on your support. and get our weekly e-newsletter.